Your surgeon will make 2 or3 small incisions around the hip joint area. 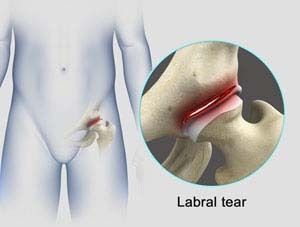 The arthroscope is inserted into the hip joint through one of the incisions to view the labral tear. The camera attached to the arthroscope displays the image of the joint on the monitor. A sterile solution will be pumped into the joint to provide a clear view and room to work. Through the other incisions specially designed instruments are inserted. Your surgeon repairs the torn tissue by sewing it back together or removes the torn piece all together, depending upon the cause and extent of the tear. After the completion of the procedure, the arthroscope and instruments are removed and the incisions are closed.